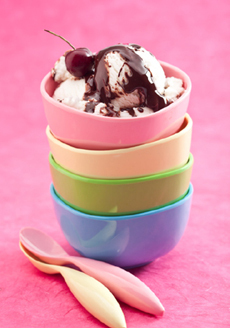 A simple sundae: ice cream and at least one topping. This is Page 4 of an eight-page article on the history of ice cream. Click on the black links below to visit other pages. In the late 19th century, ice cream was widely available, through street vendors and at ice cream parlors. In 1874, the concept of the American “soda fountain” and the profession of the “soda jerk” emerged with the invention of the ice cream soda. Ice Cream Soda. The ice cream soda was invented in Philadelphia in 1874 by Robert McCay Green, operator of a soda fountain at the Franklin Institute’s semicentennial celebration. He wanted to create a something to attract customers away from another larger, fancier soda fountain down the street. The result: a combination of vanilla ice cream and soda water and a choice of 16 different flavored syrups. Alas, the competitors soon began selling the new sensation. Green's will instructed that "Originator of the Ice Cream Soda" was to be engraved on his tombstone [source: Wikipedia]. A classic ice cream soda. Photo from the book, Make Your Own Soda. 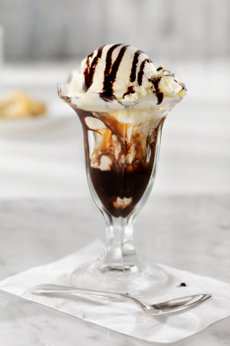 Ice Cream Sundae. Evanston, Illinois has laid claim to the birth of the ice cream “sundae” on religious grounds: In the late 1890s, it was a very religious place, with the sabbath restricted to prayer and reading the Bible—even bicycles were chained up. No bubbly, hedonistic ice cream soda could be enjoyed. 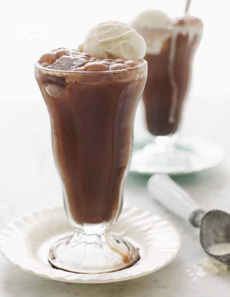 So, the story goes, a soda jerk left out the carbonated water and invented the ice cream “Sunday”; the religious leaders forced a spelling to “sundae” to remove any connection to the holy day. However, as Michael Turback, author of A Month of Sundaes, reports on icecreamsundae.com, there’s not a shred of evidence to document this. Instead, the birth of the sundae goes to Ithaca, New York, which as what is the earliest known documentation via an ad placed by Chester Platt in the Ithaca Daily Journal on April 6, 1892 for the “Cherry Sunday” served at Platt & Colt’s soda fountain. It was born on a Sunday before then when the Reverend John M. Scott of the Unitarian Church visited the Platt & Colt Pharmacy for his usual dish of vanilla ice cream after services; and Chester Platt poured cherry syrup over the top of the usual plain vanilla scoop and dressed it with a candied cherry. As the two men pondered over what to call the delightful new concoction, Scott proposed that it be named after the day on which it was invented. Other people and places may lay claim to the invention, but Chester Platt and Ithaca have it in print. Photo courtesy The Wholesome Junk Food Cookbook. Soda Jerk. “Soda jerks” were the mixologists of their day, inventing treats to excite customers. Malted milks, banana splits and phosphates emerged. Soda fountains were the equivalent of today’s Starbuck’s, where people met for refreshments and socializing. In those days, “jerk” was not a derogatory term; it referred to the quick, sharp pull as the attendant drew the carbonated water tap forward.